May 8th, 2011 – Everyone in this world was celebrating the Mother’s day!! I am sure you all did too! But I was wondering that do we need a particular day to appreciate our Mother? Can’t we do something nice for her often when she has made all the efforts through her life to make our life beautiful? She never needs any Children’s day or something like that to appreciate her children. Then why do we need it? I mean while we do have an ability to show our love and care to our spouse or boyfriend/Girlfriend, then why can’t we show it to a person who gave birth to us? I don’t do it either. Which makes me very sad sometimes but it’s better late than never. Isn’t it? So on this Mother’s day, I was also missing the time I spent with my mother back home in India. And I was memorizing all the good times we spent together. My mother is fabulous. I really do not have any words to describe her. She is full of selfless love and care. She always puts others first before her own needs. To her all her kids are the same, we are her world. Sometimes we do give her very hard time but her heart always forgives us. It says that “Ma mamta no dariyo” where “Ma” means Mother,“ Mamta” means Love & Care and “Dariyo” means the Ocean. So the proper meaning is that “Mother’s heart is as big as an ocean, which is always full of selfless love and care”. As you all know by now that I love cooking and since I’ve got this beautiful gift from my Mother, I thought is there any better way to honor my Mother than preparing her favorite dessert? So I made these beautiful Black-forest cupcakes which I assure she will enjoy (Too bad she can’t enjoy it through Skype!!:(). So this post is dedicated to My Mother, My Mother-in-law and all other mothers in the world. You all rock!! We love you! "That's for You my Mother"!! 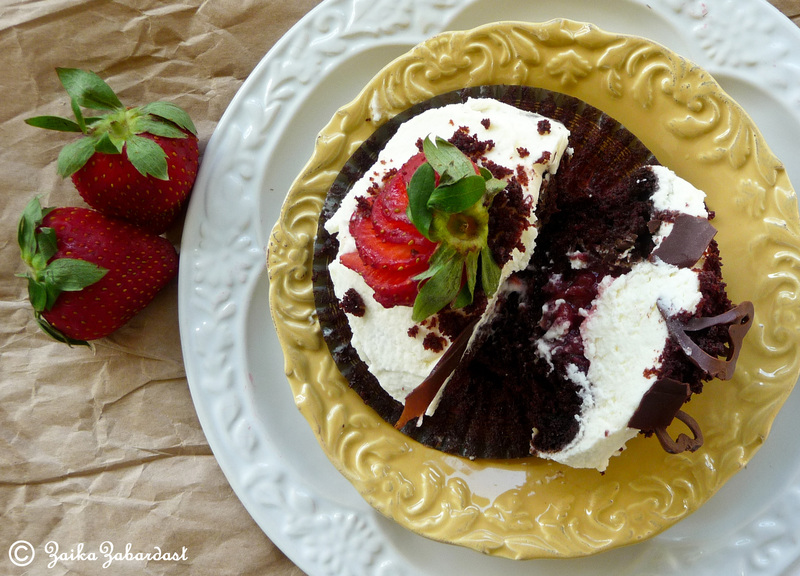 Black-Forest cake: Don’t you ever wonder with this weird name for this delicious dessert? I was randomly thinking that it must have been named after some Forest which is all black. Did u not think of the same? Or it was just me? J But Guess what, I was partially right. It is not named after the Black Forest (Schwarzwald) mountain range in southwestern Germany but it is named after the specialty liquor of that region, known as Schwarzwälder Kirsch(wasser) and distilled from tart cherries. This is the ingredient, with its distinctive cherry pit flavor and alcoholic content that gives the cake a special kick. Cherries, cream, and Kirschwasser were first combined in the form of a dessert in which cooked cherries were served with cream and Kirschwasser, while a cake combining cherries, biscuit and cream (but without Kirschwasser) probably originated in Germany. (Source: Wikipedia). It’s always good to know the history behind all the delicacies. Isn’t it? 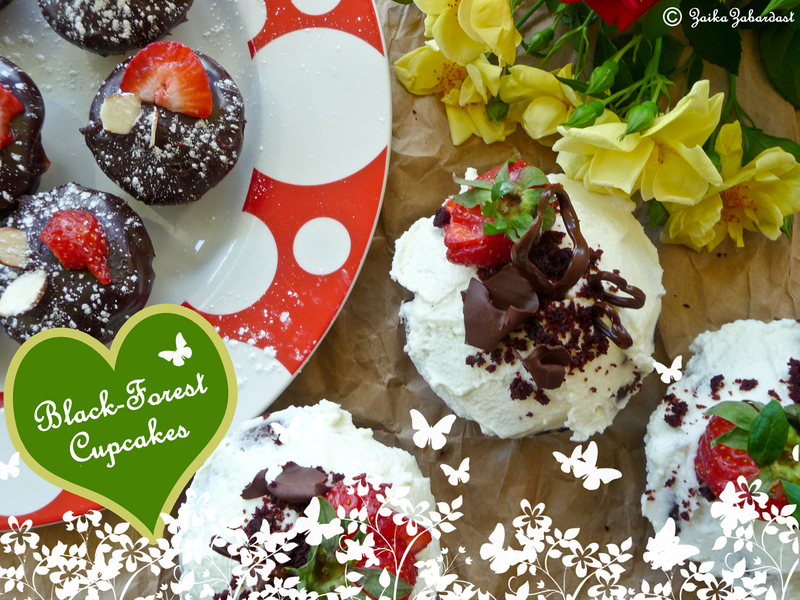 So here is my modified version of the Black-Forest cupcakes. Modified because I do not drink alcohol and I do not like cherries. But do not worry it is absolutely delightful and full of flavors. And the chocolate cupcakes are vegan. That means they are healthy too. No need to feel guilty. But For the icing I have used heavy whipped cream which is not vegan. Preheat oven to 350 F. Line your cupcake pan with your favorite cupcake liners. Sift or whisk together flour, sugar, baking soda, and salt into a bowl. In a separate bowl, mix the almond milk, oil, chocolate extract, and vinegar. Combine the wet and dry mixtures and whisk until thoroughly mixed. Distribute batter into lined cupcake baking pan, and bake for 20-25 minutes. To check if your cupcakes are done or not, use your cake tester or toothpick, place it in the middle of the cake and pull it back out –- if it comes out clean or only few crumbs clinging on it, then the cake is done. But If there is gooey batter or many wet crumbs on the cake tester, return the cupcakes to the oven and continue baking. Do not forget to set the timer again! I usually check after 4-5 minutes. Normally it should not take longer than this, if you have followed the recipe correctly. Once, your cupcakes are done, take them out of the oven and let them set in cupcake pan for 5 minutes. Then take it out on cooling rack and let them cool completely before you start icing it. It has to cool completely. While your cupcakes are in oven, you can get your strawberry syrup ready. Since it also needs to be completely cooled and chilled before using. Correct measurements of ingredients are very very important. Do not just assume it. Do yourself a favor and buy a set of Measuring cups and spoons. You will get best results and you will thank me later on. Correct temperature is also very important while baking. If your oven has digital display then it’s easy to know when it reaches at the right temperature. But if you have non-digital one then let your oven pre-heat for around 12-15 minutes. Till then you can get other things ready. Soaking Liquid: This can be done while your cupcakes are in oven. To keep your cake moist you need to apply soaking syrup. It is very easy to make and requires around 5 minutes. Combine all the ingredients above and mix well. Set aside. In a small saucepan, add water, chopped strawberries and sugar. Let it cook on medium heat till strawberries are tender. Once it is tender, let it simmer on low for 5 minutes until the mixture becomes a pourable consistency. Remove pot from heat and mix in vanilla, lemon juice and salt. Taste and adjust sweetness by adding more sugar if necessary. Let cool in refrigerator. (I just made half the quantity since I needed it for only 6 cupcakes). Whip cream until almost stiff. Add sugar and strawberry syrup; beat until cream holds peaks. I usually beat on high for about 5 minutes, scraping down the sides with a spatula often. Pipe or frost with a knife. (Some people even keep the mixing bowl and beaters in the fridge so it will make the overall beating procedure faster. You can spread over this on top of cakes, cupcakes, custard etc…possibilities are endless). I even made some cute little chocolate hearts. Just use your imagination. Using a spoon, cut out a small hole from the top of each cupcake (scoop out about 1 tablespoon of cake from each cupcake) and do not discard it. You can use it on the top to garnish (we will call it crumbled cake). In the hole of the cupcake, layer approximately 1 teaspoon of soaking liquid, 1 tablespoon of strawberry sauce, 1 teaspoons of cacao (optional), and piped frosting on top. 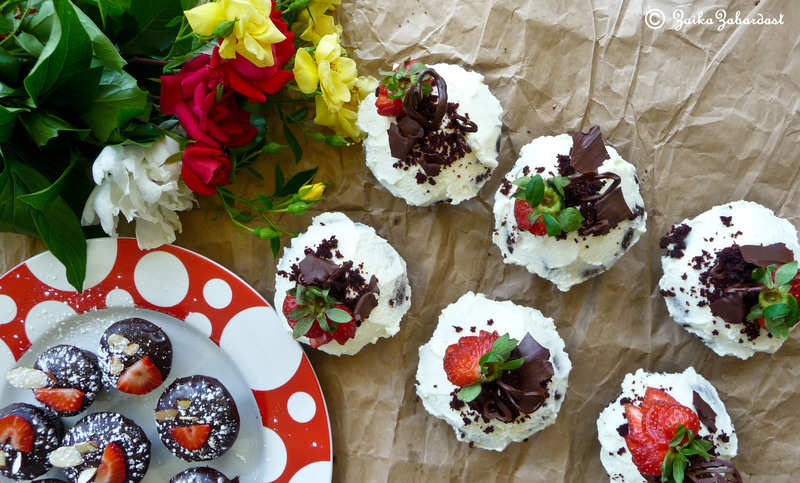 Garnish with a strawberry, crumbled cake. Let them sit in refrigerator for about an hour. Enjoy! P.S: I would also like to thank my friends Poojitha n Sam for helping me through photo session. 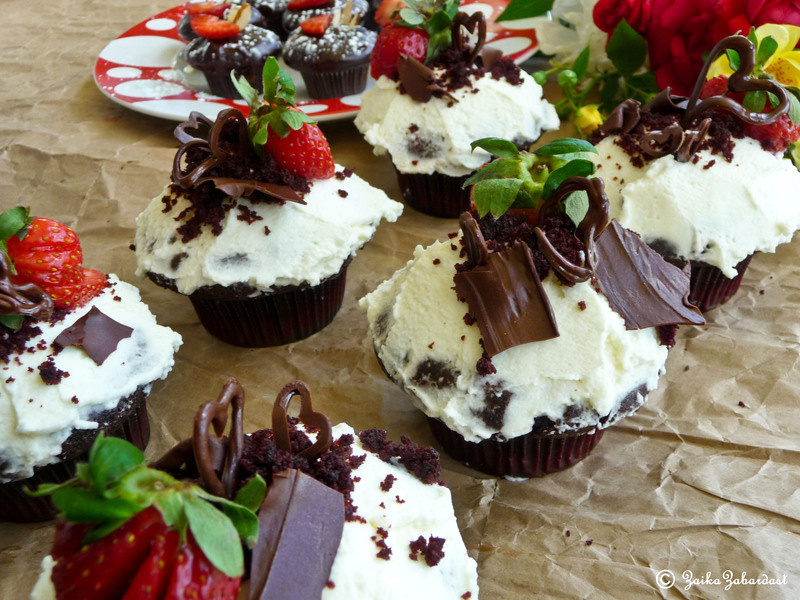 If you do not prefer to put all this effort , you can just simply decorate your cupcakes with some other simple icing. 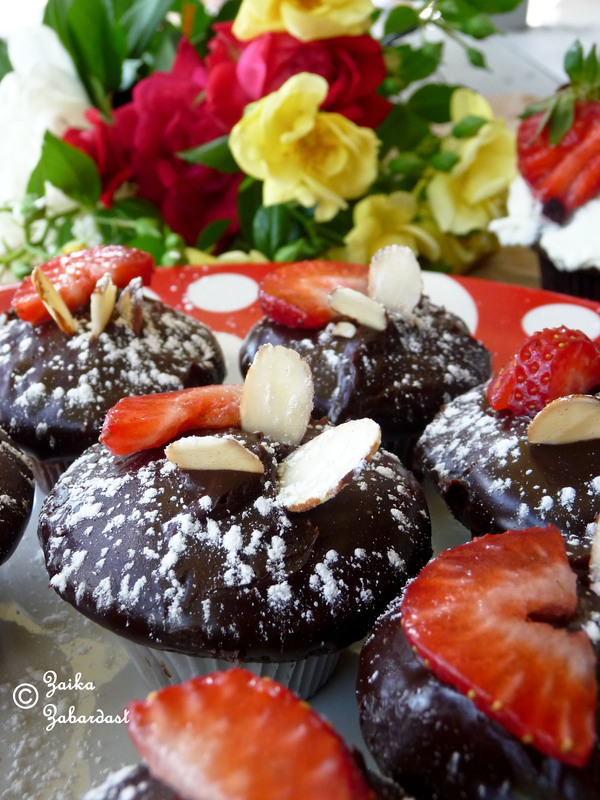 Say for example, for these small cupcakes I have used simple chocolate cupcake recipe followded by Chocolate Hazelnut Ganache. Ganache word sounds complicated but it’s way to easy to make. This is a rich, chocolate topping or decoration that has lots of uses. It can be whipped as filling or icing, or just poured over whatever cake you like. Place the chocolate into a medium bowl. Heat the cream in a small sauce pan over medium heat. Bring just to a boil, watching very carefully because if it boils for a few seconds, it will boil out of the pot. When the cream has come to a boil, pour over the chopped chocolate, and whisk until smooth. Stir in the hazelnut essence if desired. Allow the ganache to cool slightly before dipping your cupcake head to it. Or even pouring over a cake. Start at the center of the cake and work outward. For a fluffy frosting or chocolate filling, allow it to cool until thick, then whip with a whisk until light and fluffy. After applying the Ganache let your cupcakes set in Fridge for an hour or so before serving. ENJOY!I hope you will try it and Enjoy it!! Although it looks long and complicated, believe me it’s very very easy to make! We had it and it was so yummy. Am sure you guys are gonna love it. My 2 year old is a big fan of Grishma’s cupcakes. :) Grishma- You are Awesome!! Thanks a lot Praveena!! I am glad you enjoyed it. Really awesome…I can say that this is one of the most wonderful recipe of black forest cupcakes…they are looking gorgeous…fabulous way to celebrate mother’s day…as I am a lacto vegetarian I am always in search for some good egg less recipes..so saving this to make for some special occasions. And the testament from your friend in her comment surely proves that these are best…cheers. Thanks Raji for appreciating it!! I can imagine the pain for you to look for a perfect egg-less recipe. I have done that too!! But try this one. I guarantee it will come out nicely. It is moist, soft and it has perfect balance of flavors. Moreover to that they are vegan so eat as many u like. Thanks to ChefChloe for the wonderful recipe. These were the most amazing cup cakes ever 🙂 Will surely try it sometime soon and tell you how it is. 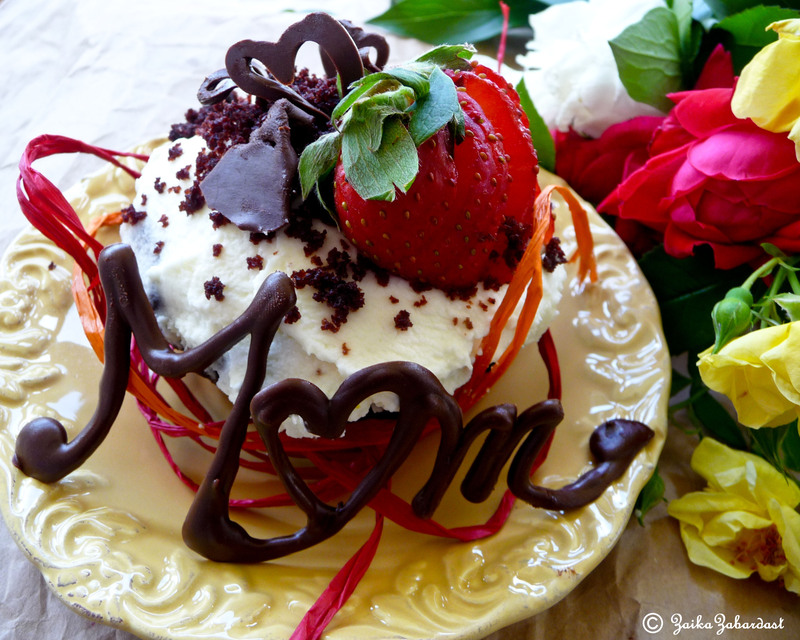 I might just make this for my mom on her birthday next month! Thanks Sam 🙂 Yes, u should make it for ur mother. She will love it. I love how the colors of this post and dessert are so dramatic. Thanks Angela. I am glad you liked it. Welcome to ZaikaZabardast. Stay tuned! Thank u Petitchef!! Added my blog to your site. bumped in just by reading ur name. My daughter is also Greeshma. These look awesome!! I should try making them! !